Can you remeber when botled water first came out, and we all sniggered and said, "Who'd pay for a bottle of water, when you can just turn on the tap?" Now it's become the staple drinking water supply for people around the world. So what's next? Marc Kirkland, 50, of Salt Lake City, Utah, has dedicated more than a decade of his life to a single concept: The sandwich in a can. TODAYshow.com writer Laura T. Coffey conducts a taste test and gives the PB&J Candwich a thumbs-up. Kirkland knows his products won’t be a hit with busy moms, kids or anybody else if they don’t taste good. To demonstrate the virtues of “shelf-stable bread” and sandwich fixings that have a long shelf life, he sent two peanut-butter-and-jelly Candwich samples to TODAYshow.com. This writer tried them, and you know what? They weren’t bad at all. In fact, they tasted just like standard peanut-butter-and-jelly sandwiches made with hot-dog buns — a perennial kid-lunch staple. 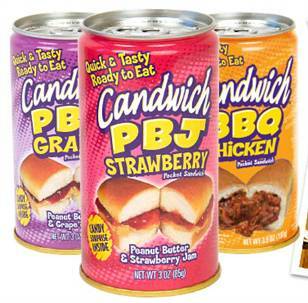 To build a PB&J Candwich, you spread the contents of squeezable peanut-butter and jelly packets onto a hot-dog bun that has been stored separately in cellophane.The sandwich samples Kirkland shared with TODAYshow.com included the ingredients that would have gone inside a can: A hot-dog bun wrapped in cellophane; a squeezable packet of peanut butter; a squeezable packet of jelly; and a small piece of taffy for dessert. You just build your own sandwich and nosh. The shelf-stable bread Kirkland uses for the hot-dog buns wound up sitting in a FedEx package for five days, but it still tasted, smelled and felt just fine. Pretty soon consumers will be able to add a sandwich to their soda order when they do business with a vending machine.He foresees the products selling in soda vending machines for $2 to $3, and in grocery stores and convenience stores for varying prices. I have a feeling there would be lots and lots of preservatives in those sandwiches, at least a lot of salt! Not very healthy, but if there's nothing else around, it would do. California Grins and Bares It!